In February of this year Janet Napolitano announced UC Regent approval to support campuses with a Pay for Performance program for policy covered staff for 2016. This merit-based approach is a result of recommendations and analysis from Systemwide Human Resources and Compensation, as well as, feedback received from staff in the most recent Engagement Survey communicating staff’s desire to differentiate pay based on performance and receive more recognition for personal contributions. With proper distribution of performance ratings, managers can differentiate merit awards and appropriately recognize the strongest contributors. This program targets all policy covered staff (non-represented) in career or partial year career appointments.Through an annual performance review, the goal is to reward higher performance with higher pay. Annual reviews provide an opportunity for meaningful conversations between supervisors and employees about our work at UC Santa Cruz. It’s a time to celebrate accomplishments, evaluate performance and think about how we can grow professionally. With our new pay for performance program for policy covered staff, performance appraisals are more important than ever, as they are a basis for differentiating pay for performance. Appraisals for policy covered staff for the 2015-16 review period are due to your Staff Human Resources (SHR) Employee Relations (ER) Analyst by Monday August 1, 2016. Appraisals for represented staff are due Wednesday August 31, 2016. Managers who are scheduled to leave for the summer months or who supervise staff on summer furloughs, should complete their performance appraisals in June to meet the August deadlines. Standardized appraisal forms and overview information are provided at:http://shr.ucsc.edu/procedures/performance_sup/index.html. Managers are also encouraged to solicit self-appraisals prior to completion of performance appraisals. Self-appraisal forms can also be found at the above link. Your Employee Relations (ER) Analyst can provide you with advice and assistance in discussing pay for performance with your staff and in writing performance appraisals.When reviewing a performance issue that may warrant the rating of “improvement needed,” or “unsatisfactory,” please engage with your ER Analyst for assistance prior to delivering the performance appraisal. Classroom training sessions every Wednesday from 2:30 to 4:30, starting June 8 through July 27. Enroll at the UC Learning Center. For further information regarding the performance appraisal process or pay for performance. Please contact your Employee Relations (ER) Analyst to arrange a consultation with your division/unit. Contact Bill Parro at wcparro@ucsc.edu for training related questions. 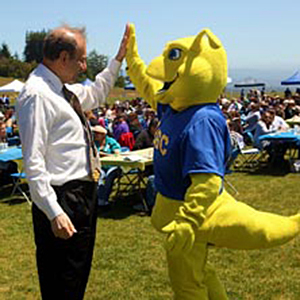 If you have enrollment questions, please contact Julie Black at jxblack@ucsc.edu.